I met Aaron during a December book signing at The Bookman bookstore. We have been celebrating West Michigan children's book Author Illustrator Aaron Zenz all week! He has illustrated 33 children's books and 9 are picture books he has written & illustrated. They include I Love Ewe:An Ode to Animal Moms, Chuckling Ducklings and Baby Animal Friends, Monsters Go Night-Night, The Hiccupotamus along with many, many more. We enjoyed learning more about Aaron from his father daughter clip titled 6 Questions in 6 minutes for Claire's Day to the ArtPrize installation "Rock Around" he made with his kids. Aaron's work is wildly fun and full of energy. He has been a joy to feature (he also has 12 bookcases filled with nearly 5,000 picture books!). We are grateful for his highly creative contribution here which includes an interview at the very end. In addition to Aaron's designs, his kids Lily, Elijah & Evie created characters for us as well. Thank you kids! Great job Team Z! We love them all! When I was a kid, my favorite books were Lloyd Alexander's Chronicles of Prydain. I lived in those books, breathed them, dreamed them, started writing like them. I don't know if I had a favorite character, but I loved Taran, Fflewddur Fflam, and Llonio in particular. And you've got to love Gurgi. In my book Monsters Go Night-Night, all seven monster characters were based on drawings my son Elijah had made when he was 4 and 5 years old. It was great fun to use his drawings as a starting place and to put my own spin on them. When designing the look of a character, I do a lot of research, observation, and doodling. When I got the assignment to illustrate a series of books about a little Bichon Frise puppy, my first step was to spend an entire day at the library with a tower of Bichon books. I made hundreds of little drawings, dog after dog, pose after pose, trying to figure out what exactly makes a Bichon "Bichon-y." When I set out to illustrate a book about orangutans, I spent days google-image-searching orangutans, analyzing how God put them together, trying to figure out how to simplify the forms. I loved the one that turned into the screaming opossum :) Of my four blob-doodles, it has the most extreme expression and I like that -- I like how the shape pushed me further than I might have normally gone. Thank you Aaron, Lily, Elijah & Evie for being our special 100th Post Guests! The Blob Blog has reached a milestone! Since its launch in 2014, this blog has birthed 400+ characters! Some have even inspired my very own picture book dummies. Not only have we (my kids and I) introduced new characters to this world, but I have asked wonderful artists I have met on this journey to join me as Guests. They have been kind enough to share their talents here too so kids can see that Blobs are not about finding the right answer, but discovering your very own. Below are the Blobs he will be creating characters with. Please join him and post your own throughout the week using #theblobblog100 on Twitter or Facebook! Shape turns into a BLOB! This also gave me an opportunity to experiment with different brushes! Next, I positioned my characters. ELEPHANT got flipped and I finished PEACOCK's stance. I didn't have his full body in my initial character sketches because the shapes were too close together. Maybe there's a dance party in their future. Thanks for stopping by and be sure to check in next week for a big giant #100 Celebration of Blobs! We have an extraordinary Guest Artist lined up! See you then. Find character inspiration with this new batch of blobs! Results are ready! Sketches only this week...getting ready for a school visit and Writers Conference! What is a DOUBLE-FINNED SHARK to do? Now, Giraffe is clearly off anatomically. Its a bit of a stretch : ) But, it's an idea, right? And that's what Blobs are for. Setting off story sparks. A design/color round would correct him a bit and maybe have other zoo animals join in? Once I created him I started doing something else and when I looked at my sheet again it was rotated. Another character emerged...it looked like a bird creature of some sort driving a convertible? Can you see it? I liked the idea of that shape becoming a car, so dug a little more. I was stuck on my animal though! What is it? A bird wasn't working, then he started morphing in to a panther...but that just doesn't make sense too. Maybe YOU can figure it out! Let me know if you do! 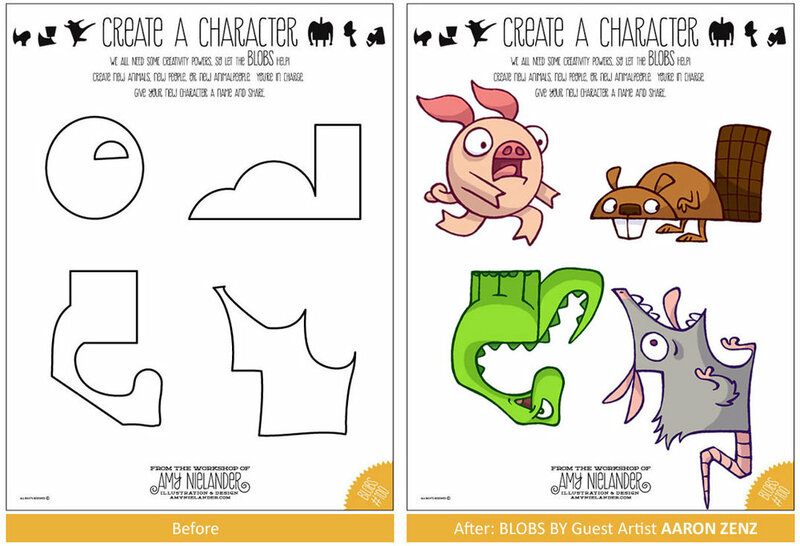 Create new characters with a fresh batch of Blobs here! Check in on Friday for results. A fresh batch of Blobs are ready. Create a new set of characters here! Welcome to Results Day! Blobs were inspired by Valentine's Day this week, which could only mean one thing. Characters were filled with LOVE. I liked the idea of DUCK being in love. And had a sweet little balloon for that special someone. But, who was it? DEER? or BUTTERFLY? DUCK needed a companion so I decided to color him up. I discovered the Australian Wood Duck in my research. They are a little different than the typical duck because of their shorter bill. but decided it was taking away from BUTTERFLY and the flowers in the end so took it out. Here's what I ended up with! BALLOON FOR BUTTERFLY! Download your batch of Blobs here! Can you tell how Valentine's Day may have inspired shapes?